WORCESTER, Mass. 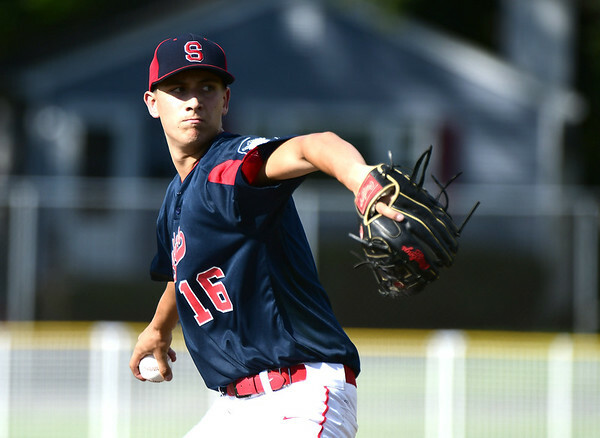 - The Southington American Legion baseball team started out slow and never really got going in its Northeast Regional opener on Wednesday. The team lost to Essex, Vt., 4-1. Southington’s offense struggled to get anything going against Essex starting pitcher Maverick King, managing just five hits, two off the bat of Dylan Chiaro. King struck out nine batters in his complete-game effort and walked just one batter. Chiaro was the lone bright spot in the Southington order, going 2-for-3 with a double. He scored his team’s only run on an error by Essex’s Cory Giannelli in the sixth inning. Jason Krar and Ryan Sheehan struggled on the mound for Southington over the first five innings. Krar started and went just one inning, giving up a run on three hits, one walk and one strikeout. Sheehan was an ace for Southington in the state tournament, but struggled at times against Essex. The tall right-hander gave up three runs over four innings, surrendering five hits and three walks. Justin Verrilli and Jacob Weed finished the game with scoreless sixth and seventh innings, respectively. The four pitchers combined to give up 10 hits, five walks and five strikeouts in the game. But for Verderame, it all comes back to the offense. The top half of the Essex lineup proved to be dangerous throughout the game. The top five hitters in the order - Ryder Thornton, Grady Cram, Ryan Young, Giannelli and George Goldsworthy - combined for seven hits, four walks, two RBI and three runs scored. Southington is now faced with a win-or-go-home situation for the rest of the tournament. Its first test will be Thursday at 9:30 a.m., when Southington will take on Connecticut runner-up Ellington. Southington is coming off of a two-game sweep of Ellington in the state final last weekend. Nick Borkowski will get the start on the mound for Southington. Verderame said there are plenty of offensive adjustments his team needs to make to back up his pitching staff. The team will have to win four straight games in order to capture the regional championship and move on to the American Legion World Series, which begins Aug. 16 in Shelby, N.C. But in Verderame’s eyes, if there is any team that can get the job done, it’s his squad. “I think we belong here,” Verderame said. Posted in The Bristol Press, Southington on Wednesday, 8 August 2018 19:19. Updated: Wednesday, 8 August 2018 19:21.